As a fan of the original Mirror's Edge, I had high hopes for Mirror's Edge Catalyst. Unfortunately, like the city it takes place in, it's rather superficial and lacking in soul. Once again the game casts you as Faith, a 'runner' who uses her athletic skills to traverse the city's rooftops, carrying objects and messages. Why? I'm not entirely sure since, while the game's opening scrawl underlines the oppressive nature of the city's regime, it provides precious little information about Faith or her situation. So that's what happened to Emo Dad.. I was left bewildered as to why Faith had just been released for prison, who this 'Dogen' she owed money to was, or why she felt the need to pay him off rather than just keep running. As it transpired, many of Mirror's Edge Catalyst's characters and plot elements were introduced or expanded upon in Mirror's Edge Exordium comics. Trying to follow Catalyst's story felt like walking into a film half an hour after it had started. 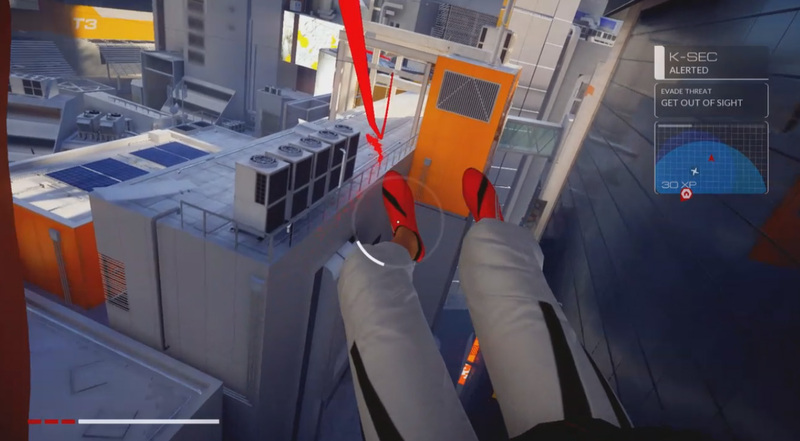 Thankfully, Mirror's Edge Catalyst's core gameplay is a little less fractured than its plot, entailing all manner of first-person parkour-related shenanigans. Parkour, for anyone unfamiliar with the term, involves running, leaping and clambering around an urban environment, trying to look cool while inwardly hoping you don't plunge to your death. Letting go is probably a bad idea. Newcomers needn't worry, as the controls are easy to pick up and the game's 'runner vision' ensures that you will always know where to go next, even though getting there may involve the odd fatal fall or seventy. Racing across the rooftops was initially a hugely satisfying experience, and I was grinning like an idiot as I belted around the city, picking up the pace as I went. While you do have some degree of freedom to explore the mid-level areas of the city – the streets being inaccessible – there's disappointingly little scope for vertical exploration. This is a noticeable contrast to zombie parkour game Dying Light's approach, where you can scale virtually any building in the game. Even when you acquire a grappling-hook style device it can be only used at specific points, meaning the city's loftier structures are largely out of bounds. If you want to experience any kind of real environmental variety, you have to tackle Mirror's Edge Catalyst's story missions, which isn't an unreasonable expectation. These missions take you inside and across various buildings including offices, warehouses and the ilk. Once inside there's typically only one way reach an objective, which is usually an item you need to acquire or a button that needs to be pushed. Although while vaulting around inside office buildings is a lark, Dice have also chosen to awkwardly shoe-horn combat elements into the game. 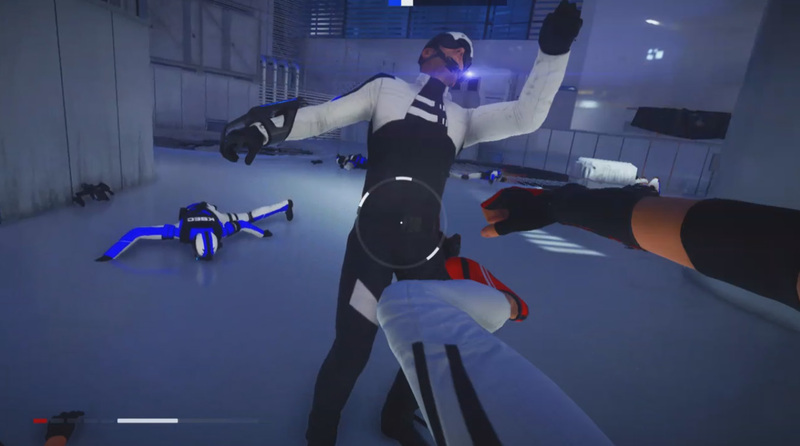 Although it's true that the original Mirror's Edge did let you tackle some of the city's guards, combat was rarely forced upon you since it was normally possible to outpace your foes. Catalyst, on the other hand, actively infuriates by forcing you to take on several foes at once, often forcing you into situations where combat is the only option. Faith does have a range of combat moves at her disposal though I found the most effective way of dealing with enemies was to get them near a ledge then yank them sideways. This in itself lead to the horrible yet darkly hilarious scenario where Faith, a character who I was supposed to root for was hurling people to their deaths. Note to EA - this is not Doom. I almost gave up on Catalyst entirely when I was locked into a small miniature arena and ordered to dispatch several waves of enemy guards, four at a time, despite there being no narrative reason to do so. The game seemed to have forgotten that I was playing as a swift yet slight Asian athlete, rather than the Doom Marine. 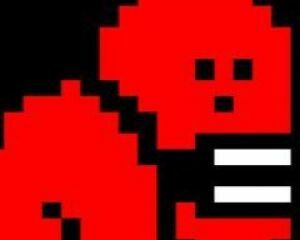 In the end I defeated them by running around in circles – building up speed allows you to block a few hits - punching one, then running around again. My ridiculous combat strategy paid off, though I expected Yakkety Sax to kick in at some point. Though it wasn't just the compulsory combat sections that caused my interest in Mirror's Edge Catalyst to wane, the more time I spent with it. Throughout the game I was totally apathetic to the game's central character and her predicament. While Faith was never the most well rounded character in the first game, I could at least understand her desire to rescue her sister. In Catalyst, she's motivated by her concern for characters who are paper-thin at best. And then there's the city itself which, while being undeniably impressive to behold, feels utterly lifeless. I appreciate that the glistening surfaces and pristine offices were meant to impart the ordered nature of Catalyst's location. But it instead gave me the overwhelming sensation that I was roaming around an empty movie set. The few non-hostile NPCs I observed, the ones who didn't try to offer me a package-delivering side-mission, just ignored me as if I wasn't there. Mirror's Edge Catalyst's did entertain me for a couple of hours but I was left with the feeling that I was, ironically, going nowhere. The characters and storyline failed to engage me and all the game really accomplished was making me want to play Dying Light, a game that features a far stronger parkour mechanic as well as a more interesting storyline. 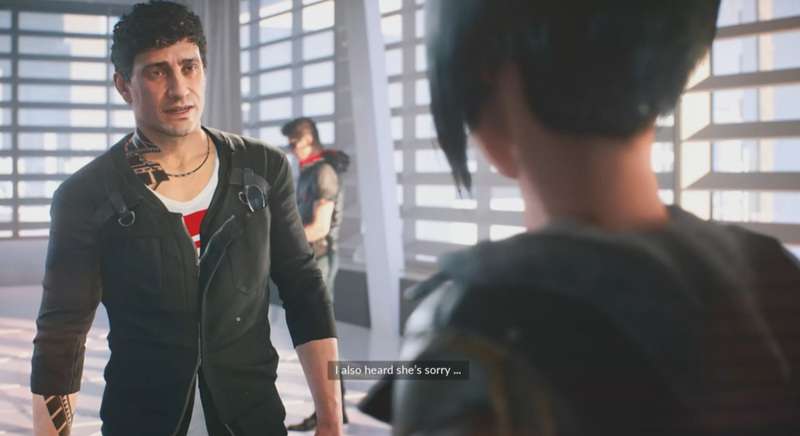 Kudos has to be given to EA and DICE for attempting to revive the series rather than just letting it rot, but given Mirror's Edge Catalyst's mediocre showing, I've no real interest in seeing the series given a third chance.